Arlene Jones - Featured Columnist Austin Weekly News: OMG - First African Who Moved To Europe Found! Dressed in a suit, this person would not look out of place in a busy street in a modern city. The clay sculpture, however, portrays the face of the earliest known modern European - a man or woman who hunted deer and gathered fruit and herbs in ancient forests more than 35,000 years ago. It was created by Richard Neave, one of Britain's leading forensic scientists, using fossilised fragments of skull and jawbone found in a cave seven years ago. His recreation offers a tantalising glimpse into life before the dawn of civilisation. It also shows the close links between the first European settlers and their immediate African ancestors. To sculpt the head, Mr Neave called on his years of experience recreating the appearance of murder victims as well as using careful measurements of bone. It was made for the BBC2 series The Incredible Human Journey. This will follow the evolution of humans from the cradle of Africa to the waves of migrations that saw Homo sapiens colonise the globe. The head has taken pride of place on the desk of Alice Roberts, an anthropologist at Bristol University, who presents the programme. 'It's really quite bizarre,' she told Radio Times. 'I'm a scientist and objective but I look at that face and think "Gosh, I'm looking at the face of somebody from 40,000 years ago" and there's something weirdly moving about that. 'Richard creates skulls of much more recent humans and he's used to looking at differences between populations. 'He said the skull doesn't look European or Asian or African. It looks like a mixture of all of them. 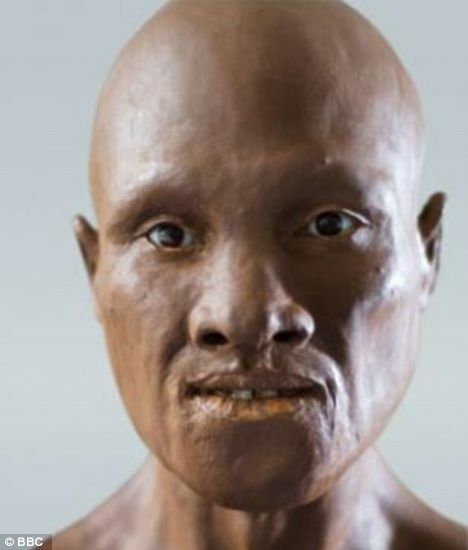 The head is based on remains of one of the earliest known anatomically modern Europeans. The lower jawbone was discovered by potholers in the Carpathian mountains in Romania in 2002. The rest of the fragments were found the following year. The bones were carbon-dated to between 34,000 and 36,000 years ago when Europe was occupied by two species of human. They were the Neanderthals, who had arrived from Africa tens of thousands of years earlier, and the more recent modern humans, also known as Cro-Magnons. Although the skull is similar to a modern human head, it has a larger cranium, is more robust and has larger molars. Although it is impossible to work out the skin colour of the prehistoric hunter, it is likely to have been darker than modern white Europeans. Fossil experts are also unsure if the skull was male or female. Many scientists believe that modern humans evolved in Africa 200,000 to 100,000 years ago. Our ancestors left Africa around 60,000 years ago and migrated around the world, replacing other branches of the family tree which had left the continent earlier. The earliest modern Europeans were far from primitive. Living in huts and caves, they used stone tools and spears made from antlers, painted on the walls of their caves and made jewellery from shells.